Part of the bargain that Donald made with the National Trust for Scotland in addition to paying for the Appin Regiment Marker on the Culloden Battlefield with “MacLaren” carved in to it was the loan of the sword. The “Invernenty Sword” on display at the Culloden Battlefield Visitor Centre is a fake. Donald Maclaren of Maclaren and Dr. E. Hamish Mclaren defrauded the National Trust for Scotland claiming that the “Invernenty sword” belonged to Captain Donald McLaren of East Invernenty during the 1745/46 Rebellion, when he was a Jacobite rebel. Willing participants but probably ignorant of the deceit in the 2007 scheme were the Clan MacLaren Society, Clan MacLaren Society of North America who have “deep pockets”, and the Clan MacLaren Society of Australia. The previous owner of the sword Dr. Janet McLaren of Invernenty never claimed it belonged to her ancestor Donald McLaren of East Invernenty, only after her death did the lie begin. Dr. Janet McLaren bought the “old scots broadsword” from an antique dealer, all knew about back in the 1970s, it is the same sword that is now displayed at the Culloden Visitor Center and labeled with the following. again on the way to Carlisle for trial"
The true account of the sword from Dr. Janet Mclaren in 1972. A reception was held for Donald MacLarenJr., October of 1972, after he reached his majority and took over as Clan Chief from the clan Tutor Dr. Janet MacLaren. At that reception Dr. Janet gave Donald an old claymore as a gift. Here is a quote from her letter to Stuart MacLaurin of Cleveland, OH describing the reception and the sword, published by Banks McLaurin in the Clan MacLaren Society, U.S.A. Quarterly #16 page 48. “The reception was in the library downstairs where Iain read our Donald's pedigree and I read out an extract from Donald's Matriculation of Arms. This ceremony took place in the presence of Sir Iain Moncrieffe of that Ilk, Lord MacDonald, Donald MacLaren Jr., his mother. If ever there was a time for the claim to be made that the sword belonged to her ancestor Donald McLaren of Invernenty it would have been then, but she did not, she simply described the sword as "an ancient Scots broadsword". It was only after Dr. Janet MacLarens death did it become a relic of the Battle of Culloden. The only provenance for the sword in 2007 was Hamish and Donald's word and a bank check written to the NTS. Donald McLaren of Invernenty biography is clear, he had not a penny to pinch when he died and owed his Stewart spouse's family a large debt, his home had also been destroyed in Invernenty after his capture by the British. I don't think they let him keep his sword. "June 22, 1746, Letter from Bisset to the Duke [James]. "The party that is at Crieff weenie to Ballquidder and burnt Glencarnocks [Robert Murray (MacGregor)] house and his whole tenants houses, Macklaren of innernenties and Stewart of Ledericks, with some innocent persons houses that were interjected among these." "Atholl Chronicles and Jacobite Letters"
A young law clerk Walter Scott visited Invernenty at age fifteen in 1767 with a small detachment of British soldiers to confront the McLarens concerning a debt and property rights. They had left fifteen years earlier for Atholl after Donald McLarens death in 1752. 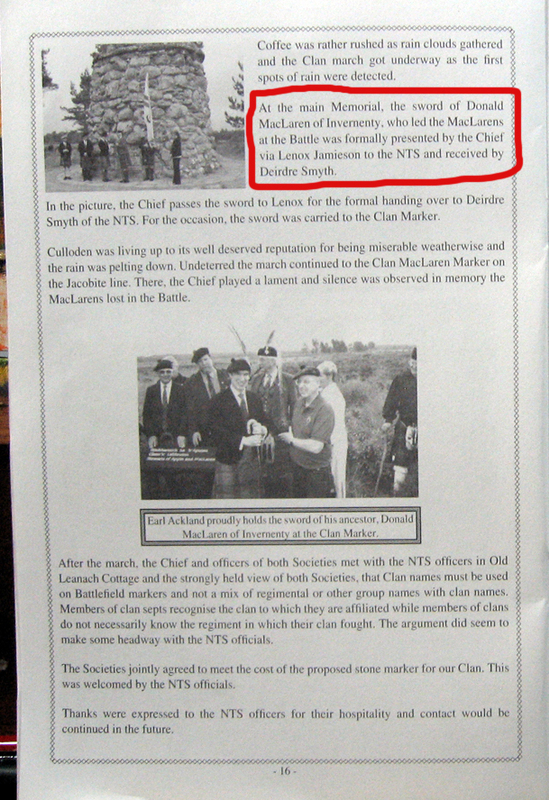 The "2nd battle of Culloden" (as E. Hamish McLaren described it) against the NTS and the Appin McLaurins, went too far with this intentional deceit. This and other information published in the original Clan MacLaren Society, U.S.A. Quarterlies. Is this one reason that the Clan MacLaren Society North America keeps the quarterlies hidden from the general public and researchers? Perhaps, as the membership declines, it is time for the Clan MacLaren Society North America to rethink their relationship with Donald MacLaren of MacLaren and focus more on preserving the history of the North American MacLarens, McLaurins and their ancestors, and not so much emphasis on the Clan MacLaren Chief's role playing and his Clan MacLaren Society created in 1957 by wealthy Londoners from a completely fictional clan history and genealogy. So now the Clan MacLarens’ symbol of the "Protector of the Clan" is in a glass display case at the Culloden Visitor Centre, mislabeled and deceiving the public.